The Philippines has a ton of dive sites, but I mainly go to Subic Bay and Coron to dive the wrecks. The drawing shown here is of the Irako, sunk in 1944, by a group of American carrier based aircraft. The Irako is Japanese Refrigerator Ship in the group of seven large ships that lie in the waters near Coron in the Calamianes Islands group (North Palawan). The other ships are freighters, a seaplane tender and a tanker. The Irako is intact except for the bridge area, which took a direct hit. It is the least salvaged wreck and has a lot to see on penetration. This dive is best made at deck level giving an average depth of 30m. The variety of fish can be spectacular. Max depth: 43m on the bottom, deck level average 30m. I could describe the various dive sites, but you can learn much more about the diving and surrounding area by going to the web sites below. 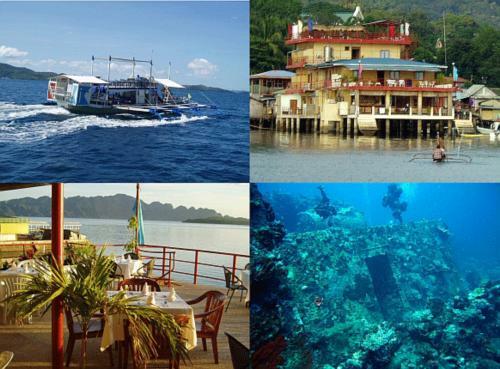 I have been to Coron about five times and I really enjoy the diving and the rural nature of the town of Coron. My last trip in October 2007, I did a four day live-aboard with a friend of mine on his sail boat. You can see photos of diving at Subic and Coron in the photo section of my profile. I can also send you a PowerPoint slide show about the wrecks at Coron.